Popular San Francisco-based store may be the victim of its own success. People walk into a Williams-Sonoma store. The San Francisco-based chain may not be able to return to its hometown because of its success. When Chuck Williams opened his first store in Sonoma in 1956, he introduced a European aesthetic that revolutionized the way Americans cook at home and helped brand the city as a place to enjoy the good life. 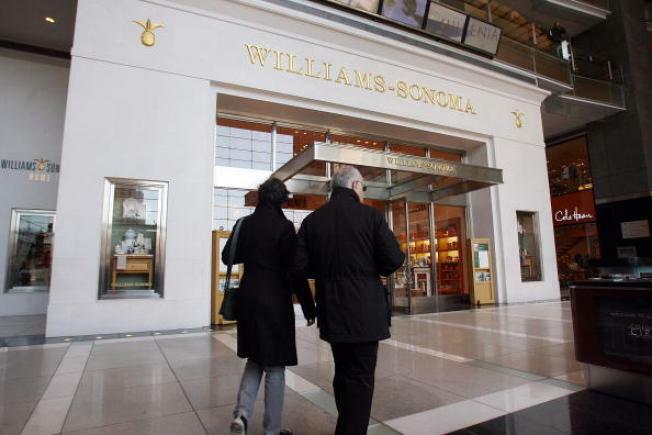 But Williams-Sonoma, which is now a $3 billion juggernaut with 268 stores nationwide, could face an uphill battle over its plans to return to Sonoma and open a store at the original site on Broadway where Williams, who is 97, got his start. The chain is now based in San Francisco and has several off shoot stores, including Pottery Barn and West Elm. That's because the Sonoma City Council is weighing whether to pass new regulations for chain stores, or formula businesses as the city calls them. On Wednesday, the council will vote whether to enact a moratorium on such businesses until a decision is reached on a proposed ordinance. "It would be an unfortunate consequence for Williams-Sonoma to not be welcomed back to Sonoma because we have decided that they are too successful for us," said Sonoma Mayor Joanne Sanders, who is a staunch opponent of chain store regulations. Representatives of Williams-Sonoma met Friday with city officials to discuss the company's desire to open the store in Sonoma. The company is in escrow to purchase the building at 601 Broadway where Chuck Williams first started selling high-end cookware. "We don't comment on our real estate until we have a fully executed lease," Williams-Sonoma spokeswoman Rebecca Weill said Friday. Williams moved the original store to San Francisco after being open in Sonoma only two years. But he told people he kept the name because it had cachet. The city of Sonoma benefited by the brand-association. There is some irony then with the chain now becoming a test of how far city leaders want to go in regulating formula businesses. Williams-Sonoma also owns Pottery Barn. The current discussion was sparked by the opening of a Staples store last year in what had been the site of a Ford dealership. The recommendations of a controversial ad-hoc committee led by Councilman Steve Barbose are now the basis of a draft ordinance that will be taken up by city leaders. Barbose declined comment on Friday. Under the proposals from the ad-hoc committee, formula businesses would be defined as any that include 10 or more outlets, excluding hotels, offices, financial institutions and other types of service businesses. These businesses would need a use permit to open. Those going in to shopping centers with five or more tenants would be exempt from the rules. The proposed Williams-Sonoma store is within the city's historical district but outside the plaza area, where the proposed regulations call for banning businesses that include more than 250 outlets. In Friday's meeting, Williams-Sonoma representatives told city officials that the company wants to build a store that is about a third of the size of a normal outlet, said David Goodison, the city's planning director. City Manager Linda Kelly said the plans were characterized as a "boutique" that would showcase the company's origins and maybe include facilities for cooking demonstrations. "It was very positive," Kelly said. "I felt it would be terrific to have such a successful business that started here to re-establish here." The use permit that Williams-Sonoma would have to obtain under the proposals made by the ad-hoc committee would include three additional criteria specific to formula businesses, according to Goodison. They include that the business promote diversity and variety, be consistent with Sonoma's unique and historic characteristics and be compatible with existing uses. Currently, other than design review of buildings, Sonoma does not define or regulate businesses that meet zoning regulations, including in the downtown area. Goodison said Williams-Sonoma could submit plans to open the Sonoma store even if the City Council on Wednesday enacts a moratorium. However, that application could not be acted upon until the moratorium was lifted, he said. The moratorium requires a fourth-fifths vote. Sanders predicted it will fail. "I don't think they have it," she said. The mayor also reiterated her concerns that formula store regulations would discourage economic growth in the city. Bur Councilwoman Laurie Gallian, who has supported new rules, disagreed. "If it's done right, I don't think this is going to discourage businesses from coming to Sonoma," she said.